The spectacular views stop you in your tracks as you enter the house. 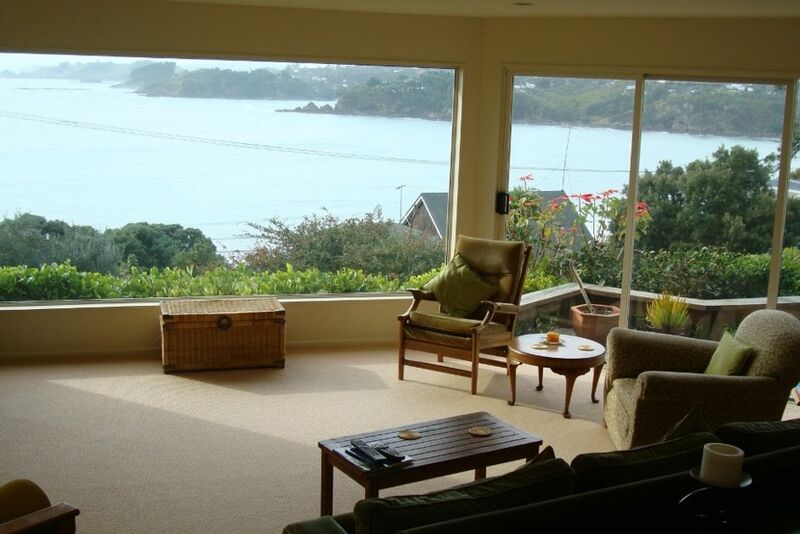 The spacious lounge has windows all around making use of those outstanding views! Ranch sliders open on 2 sides onto decks and lawn, enhancing the home's indoor/outdoor flow. Open plan living dining and kitchen areas with more sliding doors opening onto the deck from the dining area, though the living area can be easily closed off from the dining and kitchen if required. Walk along the road to the shops, cafes, restaurants and bars of Oneroa Village. Just a short wander along the road brings you to the accessway to Oneroa beach. This is what holidays are all about !! Bedroom 1 - Queen bed, electric blanket, wardrobe, drawers, bedside tables, bedside lighting. Ranch slider onto main deck. Stunning seaviews! Bedroom 2 - Queen bed, electric blanket, wardrobe, drawers, small bedside tables, bedside lighting. Bathroom: large with shower and vanity within. Separate toilet room accessed through bathroom. Kitchen: - spacious and well equipped with large island bench, microwave oven, dishwasher, coffee plunger, coffee percolator, food processor, dinnerware, glassware and cookware of a very good standard. Living area:open plan to dining kitchen and via ranch sliders onto decks on 2 sides. Wide sliding doors can be closed to separate the living from the dining and kitchen if required. TV - 46" flatscreen full HD, TV - 32" flatscreen full HD, MY SKY TV, home theatre system with 6 speakers, DVD and CD player, video player. Cellphone reception good for 021 and 027. Furnishings of good standard and very comfortable. Electric heating - reverse cycle air-conditioning heat pump. Automatic washing machine and electric clothes dryer. Iron and ironing board. Deck: north facing, opening from dining and living areas with stunning views over Oneroa Bay and out to Coromandel and the Barrier (ballustrade is low). Property is suitable for babies up to 12 months. Other children only with owners prior approval. Rates apply for 2 people. $30 surcharge per extra guest per night. Minimum of 3 nights over long weekends. Lovely comfortable house with stunning views and well located. Lovely comfortable house with stunning views and well located. Would happily stay again. Fantastic view and location. Only a short stroll to the local shops. Extremely clean and well kept property. Equipped with everything you could need plus more. Would no doubt stay here again. Amazing location and views. Would definitely stay again. We love this place, it's a perfect location near the village yet super quiet with the most amazing view to boot. Beautiful views, great location, very nice property. Beautiful views, great location, very nice property. Would love to stay again.